Lightly season the barramundi with fine salt. Place the fish onto a small ovenproof dish. Cut a few sprigs of thyme and place on top of the barramundi. Pour olive oil into the dish until it reaches half of the height of the fish. Add a few slices of garlic and cook in a 140° oven for 7 minutes. (Flip the barramundi halfway through the cooking time. 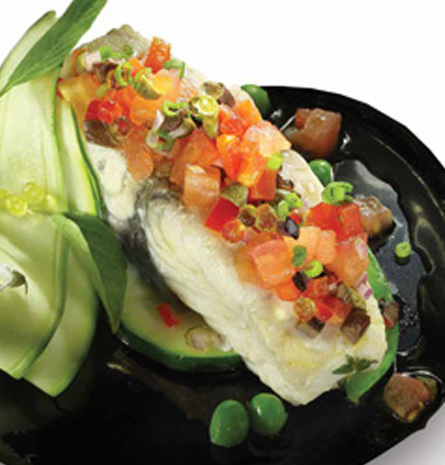 Remove the barramundi from the oven and allow it to rest for another 7 minutes. After resting, drizzle a little bit of virgin oil, fleur de sel and zest of lime. Just before serving, ignite some dried rosemary and lay next to the fish. 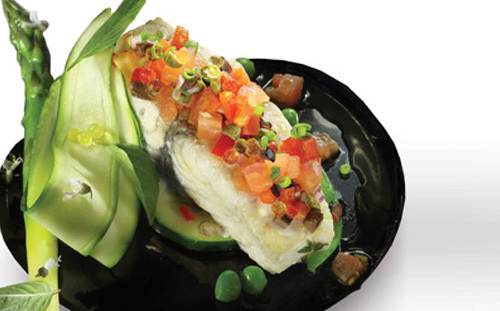 Quickly cover the whole dish so the barramundi can absorb a slight smoky scent. Wait 20 seconds, remove fish and serve. Peel the tomatoes, remove seeds and cut into nice, neat brunoise. Roughly chop the capers and olive. Thinly slice the spring onion and basil. Remove the seeds and chop the chili padi very thinly. Dice the shallot very thinly. Combine all ingredients in a bowl,season with salt, pepper and chili powder. Wash and peel all vegetables. Blanch each vegetable separately in a large volume of salted boiling water till soft and tender. Then refresh each vegetable in an ice bath. At the last minute, warm up thevegetables in a bit of beurre monte (emulsified butter and water). Using a Japances mandoline, slice 12 pieces of zucchini. Zest and juice lime and use to season zucchini.